Old, overgrown apples and pear trees can still be attractive and productive features in the garden if brought under control with pruning. Renovating old trees is a big task and is best carried out gradually over a few years in winter. This method of pruning is suitable for old, overgrown apples and pears. Whenever pruning an overgrown tree, ideally do it in stages, over a number of years. Pruning back hard in one year only encourages excessive, vigorous and unfruitful growth. Only trees with a sound, healthy trunk and main branches that show signs of having grown and cropped well in the past are worth attempting to renovate. If the work involves a number of large, heavy, branches and working up a ladder consider employing a qualified arborist. If yield is the most important factor, it might not be worth renovating an old tree. Consider replacing the tree with a new one on a dwarfing rootstock. This would crop at an early age, be easier to manage and take up less space per kilo of yield than a big old tree. Older fruit trees are valuable for wildlife and ‘structure’ and a focal point in the garden. As long as the tree is healthy and poses no safety risk retaining the tree after renovation is highly desirable. Even if trees are not in good condition, provided they do not pose a safety concern they may be worth retaining if they are an old cultivar that is rare or even lost from cultivation (‘lost varieties’). If you don't know the identity of your tree, local fruit experts can often help. If the identity of the tree is uncertain consider bringing fruit to RHS Fruit Naming days or send fruit to Brogdale Collections. Also consider propagating older trees by grafting, especially if the tree itself poses a hazard. Some specialist fruit nurseries offer a grafting service. By propagating old cultivars gardeners can help to maintain the genetic diversity and heritage of our fruit trees. Renovation is best carried out in winter, when the tree is not in leaf, as it encourages strong new growth in spring. It is also easier to see what you are doing when leaves are absent. Neglected trees often have a crowded main branch framework so the objective of pruning is to improve branch spacing, allowing light and air to reach all parts of the tree and ease picking and maintenance. An open, goblet-shaped branch structure is the ultimate aim. Size of pruning cuts: When pruning, always cut to the main stem or trunk, or back to a well-placed outward-growing side branch. The side branch should be at least one third thicker than the diameter of the branch being cut out; if smaller (i.e. weaker) they have a tendency to die back and produce watershoots from the cut end. Watershoots are tall, upright branches, that produce no flowers or fruit – see Problems section. Where to best make a cut: The ideal point to make a cut is immediately outside the 'collar' (i.e. to retain the collar), which is normally visible as a distinct bulge where the branch joins the trunk or main stem. Branches should neither be cut back flush to the trunk or main stem nor left with a large snag as these will result in poor healing or excessive dieback. See our page on tree pruning. Amount to remove: Aim to remove no more than 25 percent of the canopy in any one year, saving the rest for succeeding years if there is a lot to remove. Removing more than one quarter of the canopy in one year can lead to undesirable regrowth of over-vigorous watershoots. Excessive pruning stresses the tree which will strive to restore the balance of roots and shoots. The resulting watershoots are unfruitful and the tree will take longer to come back into cropping. Also a mass of vertical shoots crowd the crown and require further thinning. Aftercare: Mulch renovated trees in the spring following pruning, and feed with a general balanced fertiliser such as Growmore (at 70g per sq m/2oz per 10 sq yd) to encourage good regrowth. Ideally create a ‘tree circle’ free of vegetation around the base of the tree prior to mulching and applying fertiliser. The circle should be at least 60cm (2ft), but ideally 90cm (3ft) or more in radius. First, remove all dead, diseased and broken branches. Lower branches that receive little light and obstruct passage should be removed entirely or pruned to a more upright shoot. Remove branches growing into the centre of the crown and also any crossing branches. Reduce overlong and unfruitful growth to a well-placed upward and also outward-growing side branch. To avoid dieback or excessive watershoots the side branch should be at least one third thicker than the diameter of the branch you are removing. If however the canopy appears to be crowded remove the entire branch to its point of origin. Unless necessary try to avoid removing limbs over 20cm (8in) in diameter. Where the main branch framework is crowded, thin out surplus branches. Aim for a canopy with 50-60cm (20in-2ft) gaps between branches (measured from with half way up or along the branch). Remove surplus branches completely or prune to a well-placed the side branch that is one third of the diameter of the branch you are removing. If more than 25 percent of the canopy needs to be removed, spread the pruning over two to three years. Once growth is under control, consider employing winter regulated pruning in future years. This method controls the size of the tree without the need for further renovation pruning. These trees have little new growth, but often have overcrowded, dense spur systems (stubby branches producing flowers and fruit). Because there is little new growth moss and lichen readily colonise the branches (link), but these are a sign of poor growth not a cause. Remove branches growing into the centre of the tree to avoid congested growth. Low growing branches that receive little light are also best removed. Thin out some of the spur systems, removing those that are unproductive or that are overshadowing others, aiming for spacing spurs 10-15cm (9-6ins) apart. This will give the remaining spurs more space, and allow light to reach them, resulting in better fruit size and more even ripening and allowing better air movement. This will also encourage tree vigour, and new branches should grow. These will eventually replace the older, worn-out branches. To increase tree vigour remove vegetation around the base of the tree creating a ‘tree circle’ of at least 60-90cm (2-3ft) radius. Mulch the circle with 5-8cm (2-3ins) of bulky organic matter such as garden compost or well-rotted manure, but don’t allow the mulch to touch the bark at the base of the tree. Over-pruning (removing more than 25 percent of the canopy in any one year) may result in the production of watershoots (epicormic growth), which are vigorous, tall, upright and leafy branches, producing no flowers or fruit. Look out for common problems of old or neglected trees, such as canker, biennial bearing, scab, powdery mildew, rosy apple aphid and woolly aphid. 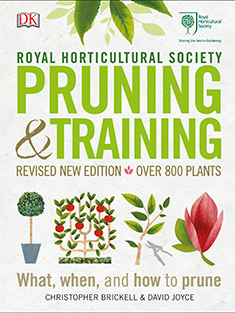 In this fully revised edition, you’ll find updated advice by the RHS experts on what, when and how to prune.